The emblem of Mackay Memorial Hospital (M.M.H.) consists of a red cross and a burning bush. The red cross is a symbol of medicine, and the burning bush recalls the bush that burned but was not consumed in the wilderness, a miracle of God. It awed Moses and summoned him to lead the Israelites out of slavery in Egypt. A BRIEF INTRODUCTION TO M.M.H. 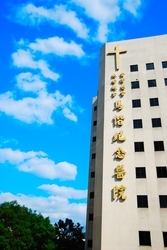 MacKay Memorial Hospital, under the jurisdiction of the Presbyterian Church in Taiwan, was established in memory of Dr. George Leslie MacKay who followed in the footsteps of his Master by coming to Taiwan with the message of salvation for all men. Even in those early days, Dr. MacKay was concerned for the whole person and ministered to the physical, emotional and spiritual needs of each patient. Dr. MacKay was born in Zorra, Oxford County, Ontario, Canada, on March 21, 1844. Even as a small child, he felt the call of Christ and wanted to become a missionary. 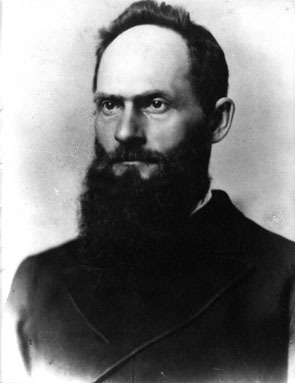 On March 9, 1872, the Canadian Presbyterian Church commissioned him to go to Taiwan as a medical missionary. In 1880, Dr. MacKay founded the MacKay Clinic in Tamshui, which was the first western hospital in the northern part of Taiwan. 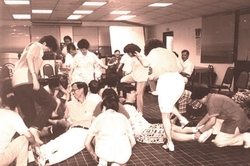 It was there, in the humble surroundings of Tamshui, that Dr. MacKay treated many patients while at the same time proclaiming the good news of Christ. 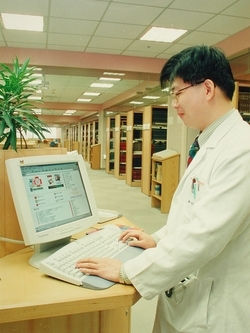 During his first twenty years in Taiwan, he received help from many foreign doctors. They treated patients suffering from a host of diseases, including malaria, which was a significant problem at that time. 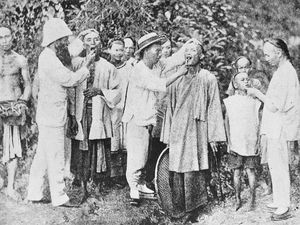 Besides treating patients, Dr. MacKay often preached and took teams of Taiwanese Christians with him on his medical and evangelistic tours in northern Taiwan. With the Bible in one hand and dental forceps in the other, he defied mountains, rivers, and jungle overgrowth to do medical evangelism. Although practicing medicine and evangelizing Taiwan was very difficult work at that time, Dr. MacKay endured for over 30 years. During this time, he not only pulled over 20,000 teeth, but also proclaimed the Gospel to many different people around the island. He established more than 60 churches and baptized more than 4,000 believers. On June 2, 1901, Dr. George Leslie MacKay died of throat cancer in Tamshui. At that time, the work at the Tamshui clinic came to a halt. The MacKay Counseling Center is a part of the Pastoral Care Department. It is staffed by professional counselors with a goal of provide emotional and psychological counseling as a complement to medical care. The center was established in 1965, providing suicide prevention and life line telephone counseling. The life line is now an independent service, but we continue to provide telephone counseling (the Peace Line), as well as face-to-face counseling. The counseling service is available to employees, patients, their family members, and the general public. To commemorate the 125th anniversar y of Dr. Mackay’s first mission voyage to Taiwan, the hospital board began overseas missionary work in 1997. 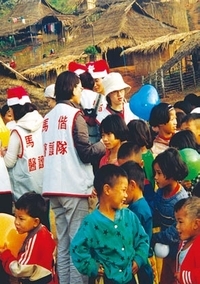 Following in the spirit of Dr Mackay’s work, the work is intended to be cross cultural service in remote, needy areas. 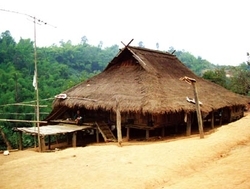 The Akah tribe of north Thailand was chosen by the Overseas Mission Board as our first mission field. To be a Christian health care institution that will take care of people in need fulfilling our social responsibility while emphasizing medical research. We want to ensure that every patient receives comprehensive treatment of body, mind and soul as a way to demonstrate God’s love, and eventually to complete our ministry’s divine mission of medical evangelism. To live the virtues of Christ and to love others as ourselves, while ensuring that patients receive comprehensive medical care. To live the motto of Dr. MacKay “Burn out rather than rust out”, and to contribute sacrificially to medical services. Utilizing an efficient operational management, to make a reasonable profit in return to support our services to the needy and fulfill our social responsibility. To encourage research in core areas while maintaining professional excellence to ensure continuous innovation and development. To be the most trustworthy medical center for minorities. To be the best Christian medical ministry in the country, dedicating all available resources to serve minorities and the needy, especially in remote areas. To be the most reputable medical center in regards to service quality. To be the most renowned institution in biological science research and among the top six medical institutions in contributions to the medical literature with a high SCI count. 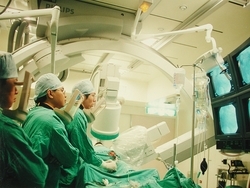 To set the benchmark in Taiwan for excellence in training medical students and residents. The provision of medical services which meet the needs of the times for critical, serious and difficult to treat illnesses, and complete cancer care, to become the number one hospital in terms of reputation for quality of service. The extensive use of new medical technology and information technology, to raise the quality of medical and administrative efficiency. The promotion of preventative health care, driving community health care, to become the most trusted hospital for vulnerable and disadvantaged groups. The implementation of holistic care in medical education and research, integrating the nursing resources of MacKay Hospital and Medical College, to become the most reliable benchmark training hospital for doctors and medical personnel. Innovation research and development which drives the development of medical technology, to become a center for biomedical research. Fulfillment of our social responsibilities, complementing health and medical policy, as the medical center with the most resources invested in remote regions. The active participation in international medical events, providing international medical support, to raise the standards of international medical care and promote medical diplomacy and medical evangelism. Traditionally, organizations tend to measure and evaluate their performance based solely on financial charts and figures, often overlooking intangible but essential factors such as organizational culture which provide the motivation to achieve sustainable growth. In response to this, MacKay Memorial Hospital introduced the Balanced Scorecard (BSC) Strategic Concept in year 2001, a model first published by Kaplan and Norton in 1992. The advantage of this concept is that it not only preserves the virtue of evaluating operating performance according to financial results but also enables us to focus on non-financial indicators, such as customer satisfaction, internal operation flow, continuous learning, and personal growth and social commitment. It will better enable us to implement organizational strategies in our daily operations, thus improving organizational competitiveness and quality-control, and eventually to achieve well-balanced development and sustainable growth. In 2001, led by our superintendent Dr. C. S. Huang, an elite task force drafted a vision for the future, a mission statement for the hospital’s ministry, and identified its core values as our guiding principles. Later, the team was divided into four units focusing on different functions: Finance, Customer Relations, Operation and Continuing Education. Each unit is to meet twice a year in March and August, with additional ad hoc meetings as needed, to review and evaluate results from previous months and come up with action plans to strengthen weak areas. All four units are to propose strategic goals and plans, in accordance with our annual budget principle. It is now the fifth year since the implementation of the Balanced Scorecard concept. In addition to continuous evaluation, the team delegated the utilization of strategic benchmarking indicators, normally a task reserved for top management, to the operational level three years after implementing BSC. The team also asked each unit to propose annual plans and a budget, based on the BSC structure, delegating more responsibility to the lower levels of the organization. We also plan to add a fifth dimension to the BSC in the Taipei centers, that of social commitment, in hopes of better serving our society and fulfilling the mission and vision of our ministry. annual plans and a budget, based on the BSC structure, delegating more responsibility to the lower levels of the organization. We also plan to add a fifth dimension to the BSC in the Taipei centers, that of social commitment, in hopes of better serving our society and fulfilling the mission and vision of our ministry. Evaluation and monitoring of efficiency. Evaluation and improvement of departmental operations. Monitoring of clinical and administrative quality. Tracking and supervising of major projects.